Messene (Greek: Μεσσήνη Messini), officially Ancient Messene, is a Local Community (Topikē Koinotēta) of the Municipal Unit (Dēmotikē Enotēta), Ithomi, of the municipality (Dēmos) of Messini within the Regional Unit (Perifereiskē Enotēta) of Messenia in the Region (Periferaia) of Peloponnēsos, one of 7 Regions into which the Hellenic Republic has been divided by the Kallikratis plan, authorized by Law 3852, Issue 1 of 7 June 2010 and Issue 2 of 11 August 2010 and implemented 1 January 2011 after elections of officers in November 2010. Before 2011 it held the same position in the administrative hierarchy, according to Law 2539 of 1997, the Kapodistrias Plan, except that Ithomi was an independent deme and Ancient Messene was a Local Division (Topiko Diamerisma) within it. Most of the area of Ancient Messene contains the ruins of the large classical city-state of Messene refounded by Epaminondas in 369 BC, after the battle of Leuctra and the first Theban invasion of the Peloponnese. Epaminondas invited the return to their native land of all the families that had gone into exile from Messenia during its long struggle with and servitude under the military state of Sparta, now finished as a conquering state. This new Messene, today's Ancient Messene, was constructed over the ruins of Ithome, an ancient city originally of Achaean Greeks, destroyed previously by the Spartans and abandoned for some time. Currently the substantial ruins are a major historical attraction. Much of it has been archaeologically excavated and partly restored or preserved for study and public viewing, as well as for various events. The site was never totally abandoned. The small village of Mavromati occupies what was the upper city around the fountain called klepsydra. Administrative structure and population figures refer primarily to it. Archaia Messene is located 25 kilometres (16 miles) north of Kalamata and 60 kilometres (37 miles) east of Pylos. The main ancient source on Messene is the Guide to Greece of Pausanias, who visited there between 155 and 160 AD. Excavation of the site began in 1828 in connection with the French Morea Expedition during the Greek War of Independence. The French left in 1833; meanwhile, only exploratory excavation had been performed. The current excavator, Petros Themelis, who received permission to dig from the Council of Athens Archaeological Society in 1986, suggests that systematic excavation of the site was first undertaken by George Oikoumenos of the Athens Archaeological Society in 1895. Since then a number of noted archaeologists have made contributions, not the least the current excavator. A museum of their extensive finds has been constructed within the old city walls. During the Bronze Age the palace at Pylos controled Messinia politically and economically. 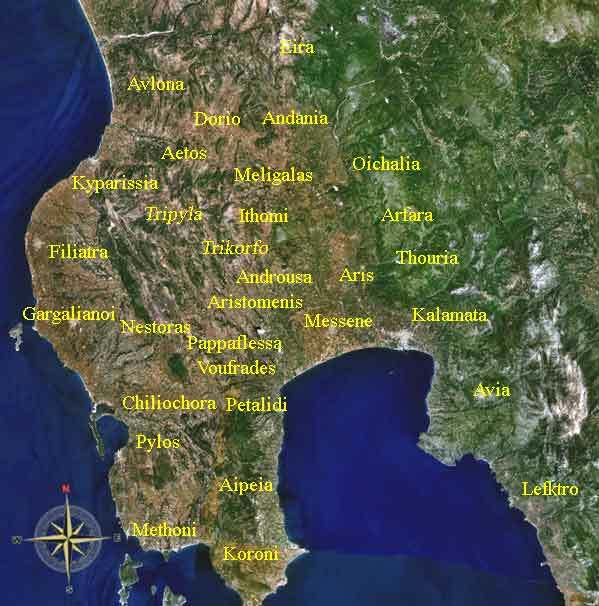 A Linear B tablet from there, Cn3, mentions a region called Mezana in local Mycenaean Greek, from which groups of men named from places in the Peloponnesus each contributed one ox to an official named Diweus. These groups were members of the coast-watchers, a military or quasi-military unit that presumably were stationed to guard various locations on the coast. Their failure is attested by the burning of Pylos a few months later by assailants unknown from the sea. The watchers include some Olumpiaioi (Olympians) from Orumanthos (Mt. Erymanthos). John Bennet expressed the opinion that by Mezana is meant Messana, a Mycenaean Greek form of Messene. He supposed that the region around Ithome would already have had that name, to be reutilized by Epaminondas a thousand years later. After the defeat of the Spartan army at the Battle of Leuctra in Boeotia, 371 BC, the helots of Messenia revolted yet again against their Spartan overlords. This time the victorious general, Epaminondas, entered the Peloponnesus with an international army of Boeotians, Argives and Messenians living abroad. Epaminondas resolved to support an independent Peloponnesus by building two fortified cities, Megalopolis in Arcadia and Messene in Messenia. After all due care to obtain omens from the gods, make sacrifices and invite the spirits of past rulers and heros to live in Messene, including Queen Messene, Epaminondas invited construction engineers and artisans from anywhere to join him. In 85 days the combined armies and exiles guided by the engineers and artisans had complete the walled city of Messene over the site of the previous Ithome. The city included within its walls Mt. Ithome and enough agricultural land and spring captures to withstand a siege indefinitely. The policy was justified almost immediately. After the departure of the Theban army the Spartans attempted to retake Messenia, which then allied itself with the Macedonians. This time the long struggle with Sparta was brought to a final end by the Macedonian conquest of Greece. After the departure of the allies the new city and the fate of Messenian independence were left in the hands of the Messenian exiles, who had returned primarily from Sicily and North Africa. Apparently they had maintained a transitory community in exile, or diaspora, for some 300 years. They spoke a Doric dialect. Pausanias reports, "even to this day they preserve it in its purity better than anywhere else in the Peloponnese." As the Arcadians are known to have spoken a dialect closely related to Mycenaean Greek, the exiles restored were not from the original Achaean refugees of the return of the Heracleidae, but were the Doricised population that developed in the 7th century BC under the subsequently dispossessed Heraclid dynasty of Messene. Messene was surrounded by a circuit wall 9 km (5.6 mi) long, 7 metres (23 feet) — 9 metres (30 feet) high. It was fortified by 30 square or horseshoe-shaped guard towers (and probably barracks) with doors admitting passage to a protected walkway on top of the wall. The wall was pierced by two main gates flanked by protective structures and rectangular in shape with a lintel of a single, massive beam of limestone. Through the Arcadia Gate to the north ran and still runs the main road north (to Arcadia), currently from Mavromati. As Mavromati is the location of the major spring capture, klepsydra, it was probably first stop for travellers to the city. From there a road runs over the ridge adjoining Mts. Ithome and Eva to the Laconia Gate, similar to the Arcadia Gate. The wall runs straight up the ridge but does not encompass Mt. Eva. Today the next stop on the road is the monastery, Mone Voulkanou, set into the lower southeast flank of Mt. Eva. Pausanias has left us a description of the city (iv. 3 1?33), its chief temples and statues, its springs, its market-place and gymnasium, its place of sacrifice, the tomb of the hero Aristomenes and the temple of Zeus Ithomatas on the summit of the acropolis with a statue by the famous Argive sculptor Ageladas, originally made for the Messenian helots who had settled at Naupactus at the close of the third Messenian War. The other buildings which can be identified are the theatre, the stadium, the council chamber or Bouleuterion, and the propylaeum of the market, while on the shoulder of the mountain are the foundations of a small temple, probably that of Artemis Laphria. ^ Hellenic Interior Ministry 2001, Line 6819. ^ Themelis 2009/2010, p. 29. Hellenic Interior Ministry (18 March 2001). "Δείτε τη Διοικητική Διαίρεση" (in Greek). Hellenic Interior Ministry.. The previous Kapodistrias organization of all the communities in Greece. The populations are from the Census of 2001.
η Βουλή (11 August 2010), "ΤΕΥΧΟΣ ΔΕΥΤΕΡΟ" (in Greek), NOMOΣ ΥΠ’ΑΡΙΘ. 3852: Νέα Αρχιτεκτονική της Αυτοδιοίκησης και της Αποκεντρωμένης Διοίκησης − Πρόγραμμα Καλλικράτης, ΕΦΗΜΕΡΙΣ ΤΗΣ ΚΥΒΕΡΝΗΣΕΩΣ ΤΗΣ ΕΛΛΗΝΙΚΗΣ ΔΗΜΟΚΡΑΤΙΑΣ. Part 2 of the Kallicratis Plan law, No. 3852, by the Hellenic Parliament (Βουλή), publishing a table of all the official communities of Greece arranged in hierarchical order. The lowest-level populations are from the Census of 2001. All higher-level populations are the sums of the appropriate lower-level populations. Themelis, Petros G (2009/2010). "Ancient Messene: An Important Site in SW Peloponnesus". The Australian Archaeological Institute at Athens Bulletin 7: 28–37. "Ancient Messene" (in Greek, English). Society of Messenian Archaeological Studies. Retrieved 13 October 2011. "Ancient Messene". Messenia. Messenia Guide. Retrieved 13 October 2011. Nikolakopoulou, Maria. "Αρχαία Μεσσήνη...Ancient Messene". Panoramio. Retrieved 13 October 2011. Papadopoulou, Christy (12 October 2006). "Messene's Archaeological Charms". Athens News. "Ancient Messene, Messenia, Greece". Europa Nostra. Retrieved 15 October 2011. Hall, Heinrich (26 July 2010). "The Glory That Was Messene". Athens News. "Ancient Messene". Wikimapia. Retrieved 15 October 2011. "Mavrommati". Fluidr. Retrieved 20 October 2011.